With today developer build, i have on all menus a big ugly black border. I have and i will not enable Compiz, never! Opera have option for Power saving mode/Battery saver, why i must enable the eye candy compositing? Please add this as option (opera://flags), for me this is unacceptable. 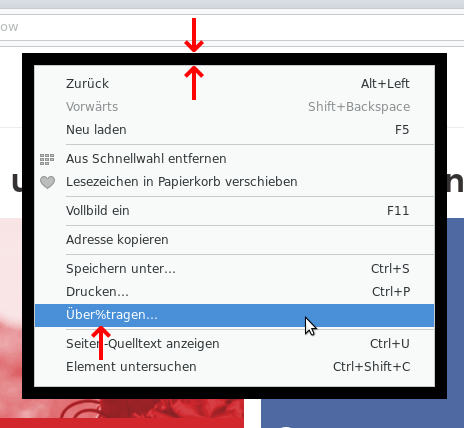 On the right click menu on website the German word ›Über%tragen‹ (Inspect element) is wrong. We were able to reproduce this only ones when running Opera for the first time. Then it was displayed properly. Maybe it's some site specific issue? It's only a problem when disable compositing (for me Compiz under Xfce). I have testing with clean Profile. Cannot more folks reproduce this issue? Opera 45.0.2548.0, using XFCE on Ubuntu 16.04.2 LTS. I don't use compiz, it is the composition of the own xfwm4, which can be adjusted using window manager settings. The black borders appears with composition disabled. The dark theme bug deserves another post, I believe. I have tested Opera 45.0.2548.0 on another system, this one with Ubuntu 16.04.2 LTS, LXDE, using openbox with no composition. It has the black borders too. I can confirm this bug. GNU/Linux 64 box with OpenBox window manager and no video compositing manager (not even installed, will not install a compositing manager). hey, the problem with the menu is another known bug, so we will be fixing it. Please do something about it. I was on opera developer until it reached version 45 and compositing messed up the menus. Then I moved to opera beta which was on version 44. When opera beta was updated to version 45 and the compositing problem was not solved, I moved to opera stable whuch is on version 44 now. If the problem exists by the time version 45 reaches stable, I will move to another browser. Debian testing x64 with openbox and with no compositing. Yes, I also believe that it will be time for me to change to Vivaldi. The Opera Devs ignore this bug and this is also in the current Opera-Beta (45.0.2552.634) inside the soon to change stable. I have spent a long time (since Opera 6.06) with Opera, it's time to go.